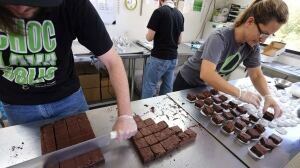 1) Canadian Supreme Court rules (on June 11, 2015) making Medicinal Marijuana legal in all forms and ways of ingesting it (as in cookies, oils, tea, etc.) . - The Federal Health minister was" outraged' by the Supreme Court ruling and vowed to combat "normalization" of pot. - In Vancouver police appear to be ignoring the marijuana controversy. Vancouver currently now has more medicinal marijuana outlets than Starbucks coffee outlets. 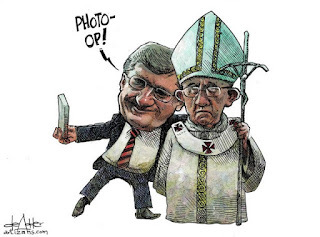 2) Canadian Federal Bill C-51 has been passed by the majority government in spite of much opposition. The recently passed Bill C-51 allows for a person to be held in jail for up to 7 days WITHOUT BEING CHARGED with a crime. All that is required is for there to be suspicion of promoting terrorism (which is not clearly defined - just social media activity is adequate). Unless the person agrees to some 25 conditions including "religious counselling" and wearing an RCMP electronic GPS tracker) he could be kept locked up for up to 12 months. Winnipeg, Manitoba, is not noted for being a hotbed of terrorism. However, on June 4th Aaron Driver was arrested and placed in jail.for verbally admitting he supports the Islamic State. He hasn't been charged with a crime, let alone convicted, nor accused of dong anything wrong. So much for our freedom of speech and legal protest. And what about innocent until proven guilty? 3) Why does the Conservative Federal Government keep introducing bills with no expectation of them ever becoming law because Parliament rises for the summer next week and the "fixed" election date is in October? Canadian sprinter De Grasse wins NCAA sprint titles. Andre De Grasse, representing the University of Southern California, produced two of the fastest times in history under any conditions to win the 100m and 200m double at the NCAA Championships in Eugene on Friday (12). His times of 9.75 and 19.58 are not "official records" because he had a wind in his back. Pope Francis' encyclical on climate change had been leaked but is now released.